After our last posting we spent two more days at Bosque Birdwatcher RV Park. The days remained great, but the nights were dropping in to the low 30s. Each day we saw large V’s of Sandhill Cranes, Ross’s and Snow Geese in migration. We stopped by on the last evening to visit the ponds on the refuge for the sundown “Fly in” of the cranes and the “Fly Out” of the geese. The geese take off to forage in the nearby corn fields during the night, while the cranes to roost the night in the refuge. There was lots of honking when the geese finally decided to leave. One thing we forgot to mention in our last posting was the Socorro Springs Brewing Company. They have really good wood oven pizza and good beer. It makes it into our top 5 brew pub list. As we were leaving Bosque Birdwatcher RV Park, we got a call from our mail forwarding service that our absentee ballots were in our mail box and that they had to be back in Texas by Election Day. So we had them overnight via FedEx our ballots to Gallup, New Mexico, our next stop. The RV Park in Gallup was conveniently located between I-40 and a very busy train track. It was a nice park but noisy. The overnight temperatures dropped into the 20s! 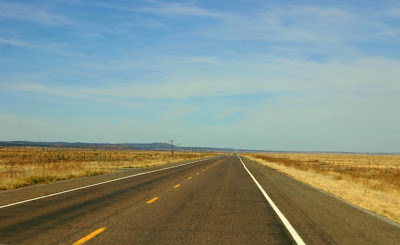 For our next stop we picked an RV park 5 miles outside of Williams, Arizona. No Interstate and no railroad tracks nearby. Although this RV Park is open year round we were their only customers. Their main building had burnt down last year and they are just rebuilding it. They have no amenities at all and no full hookup sites, just water and electric. Also they have red volcanic rock down in place of gravel, which hurt Raider’s feet so he didn't want to go outside at all. It was very quiet though! Unfortunately it was also overpriced! We moved on after one night. Next we went to Grand Canyon Caverns on old route 66. It is 25 miles off of I-40. The area was bypassed when I-40 was built. 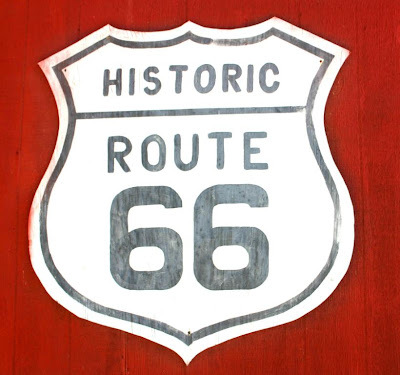 The 84 miles from Seligman to Kingman is the longest stretch of old route 66 still in use. 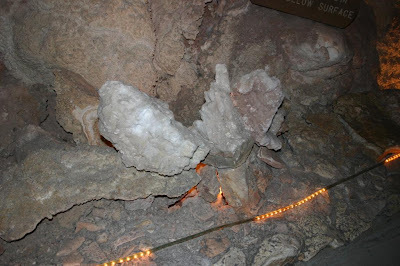 I went to Grand Canyon Caverns when I was 12 years old and it is the first cavern I was ever in. I remembered very little about the cavern or the tour. It is different from the other caverns we visited, because it is now and always was a "dry" cavern, so there aren't any stalactites or stalagmites. 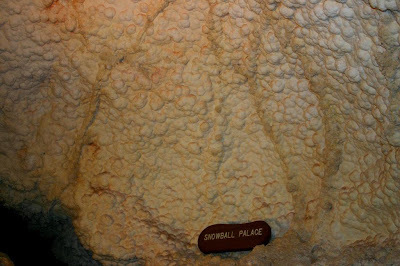 It has mostly very delicate formations and crystals. 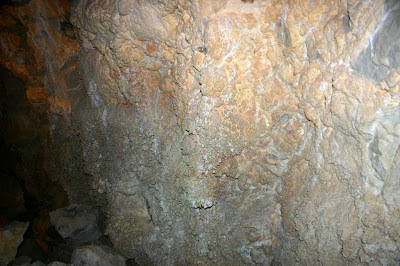 It is called a “dry” cavern because it never had water running through it. It was a good tour and there were only 6 people on the tour. After the Grand Canyon Caverns tour we went to an RV Park just outside of Kingman, Arizona. We have dropped about 3,500 feet in elevation since we left Williams so, it is much warmer here. Last night's low was 60 degrees, much better than the 20’s and low 30’s we have had lately. I'm hoping my "Happy Campers" will be rolling in here sometime Sunday!!! Can't wait to see my SASSY DOG...Hubby too-chuckle.